« Coming Soon — Retronovated Recipes! The following recipe is from our old friend, drinksmaster Jerry Thomas. In his own words “This is the genuine method of concocting a Southern mint julep…” I have used this recipe many times with great success, and highly recommend it for your Derby parties this Saturday. 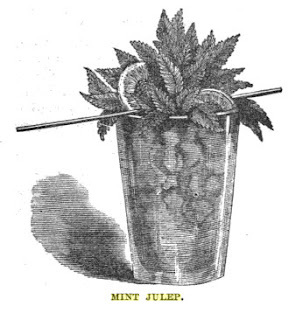 The Real Georgia Mint Julep. ¾ wine-glass (1.5 ounces) of Cognac brandy. ¾ wine glass (1.5 ounces) of peach brandy. About 12 sprigs of the tender shoots of mint. I have a few variations on this recipe: Contrary to Thomas’ recommendation, I muddle the mint, powdered sugar, and water in the bottom of the glass before adding the alcohol. You could also make a simple syrup instead. Additionally, I one day dream of making my own peach brandy, but in the meantime I find the best substitution is a peach liquor.